NoDo, the elusive Windows Phone 7 update that brings such liveliness as copy and paste to the platform has been rolling out slowly for a week or so now. The problem is, you need to wait for your particular carrier to deem you worthy of such a fantastic update, as if you haven’t suffered enough. Now thanks to a clever chappy with a blog post, you too can copy and paste to your heart’s content. All this comes about, thanks to the boys and girls of Redmond apparently, who saw fit to release a little gizmo that makes the whole thing possible. Well, first, thanks go out for Microsoft for releasing a support tool for Windows Phone yesterday. Inside that tool, were unreal hidden gems. Basically they’ve created a managed wrapper over the whole update process for us, rather nice of them. So I flashed my HTC Mozart back to RTM (7004) via a ROM update HTC ship and whipped up a little application to flash pre-NoDo (7008), NoDo (7355), NoDo update 1 (7389) & NoDo update 2 (7390) all in a single process. No I don’t care which carrier you are on, which phone you have, it’ll just update your phone accordingly. What that means in layman’s terms is anyone, with any WP7 device can now update to NoDo. All you need to do is run the ChevronWP7.Updater.exe console app and follow the prompts. Make sure you select the RIGHT language for your device. To double check what your default language is, go to Settings > Keyboard and if your selected language is displayed in the Console app, you’re good to select it. If it isn’t in the list, DON’T flash it just yet. Now, download the following files. Once you’ve installed the support tools and extracted the ChevronWP7.Updater.zip to the desktop, plug your phone in and wait 30 seconds. 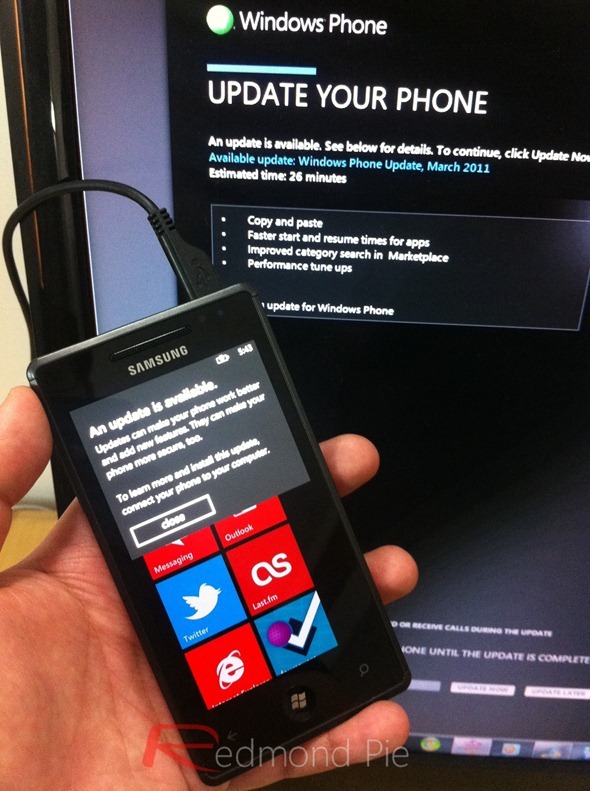 Now start ChevronWP7.Updater.exe (this should kill Zune) and follow the prompts. If you’re updating from Version 7004, you need to run the Updater TWICE, this needs the preUpdate before we can flash NoDo. Again, if your language isn’t in the Chevron updater, DON’T attempt to update your phone. Some of the applications won’t work otherwise. You can read more about it on Chris’ blog here. Good luck, and happy flashing!